Taste of Baltimore: Reader Question: Lemon Curd? Not to annoyingly self-promote, but I LITERALLY just made some lemon curd for a blog post (like seriously an hour ago) and I am wondering the same thing because the fresh stuff goes bad a lot faster. I usually put mine on english muffins, bread, oatmeal, yogurt, ice cream... yeah pretty much everything. And apparently it's good on gingerbread! citrus cake! I just e-mailed you the recipe! I'm a big fan on toast, breads, etc. as well. Tasty stuff! 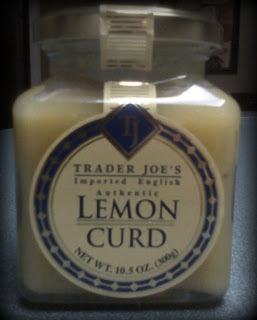 Step one: put a spoon in the jar and scoop out some lemon curd. Step two: eat curd off spoon. I'm with Kathy. EAT IT STRAIGHT! It's delicious! Also good on bread, bread pudding, and any other bread like substance. Kara - Wow! You really did! Let me know what you end up using it for? Royela - YUM, thank you! That looks AWESOME. Note: you probably don't actually want to use your thumb to press down because they'll be really hot--a small measuring spoon (like a teaspoon) works best. I use it in thumbprint cookies but I also serve curd of any flavor (pineapple is AMAZING) with poundcake and fruit. I make a great cream cheese poundcake and serve it with lemon curd and strawberries or blueberries - YUM! YUM Jennifer - can you send me a recipe?? ?